Oskar Fischinger's Avant-Garde Animation At a time when most people equated animation with Mickey Mouse, Oskar Fischinger's abstract films were genuinely new. Now 10 of his "visual music" films, credited with inspiring a generation of animators, are being released on DVD for the first time. At a time when most people equated animation with Mickey Mouse, Oskar Fischinger's abstract films were taking animation in a new, challenging direction. His short "visual music" films are credited with inspiring a whole generation of animators. Now 10 of the films are being released on DVD for the first time. In the 1936 short Allegretto, diamond and oval shapes in primary colors perform a sensual, upbeat ballet to the music of composer Ralph Rainger. The geometric dance is set against a background of expanding circles that suggest radio waves. "It was like a different language that I didn't know existed," says Pete Docter, director of the Pixar hit Monsters Inc. "Here's a guy who's doing something completely different with animation." Fischinger was a fixture of the German art world during the 1930s. 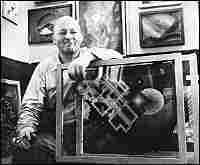 But the Nazi regime saw abstract art as decadent and a threat, and Fischinger fled his native country to Hollywood in 1935. He worked for a time at MGM and Paramount, but his style largely failed to impress Hollywood producers. Award-winning book designer Chip Kidd, an admirer of Fischinger's work, says the artist was simply ahead of his time. "He was going in a completely different direction than any other animator at the time," Kidd says. "He was really exploring abstract patterns, but with a purpose to them -- pioneering what technically is the music video." Fischinger's best-known American work is his sequence in Walt Disney's Fantasia, set to Bach's Toccata and Fugue in D Minor. Yet the German artist's collaboration with Disney was not a happy one. Fischinger was furious when his abstract shapes were turned into half-seen violin bows and stylized mountain peaks for Fantasia. 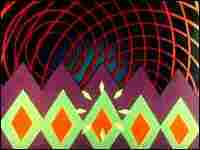 For his part, Walt Disney was uncomfortable with Fischinger's often uncompromising avant-garde vision. Forty years after his death, Fischinger may reach the larger audience that eluded him during his lifetime. Oskar Fischinger: Ten Films is hoped to be the first installment in a series of DVDs featuring the German animator's work.